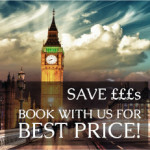 You’ve booked your family trip to London and all you need to do now is find the right hotel. You’ve visited other places and stayed in the chain hotels but now you’re looking for something a little bit different, something which is a little more personal, something which is better suited to your family holiday. Where better for a family to stay than a family run hotel like The Melita? 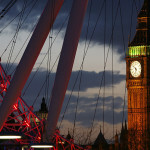 You can rest assured that a warm welcome from friendly staff and an authentic London experience awaits you. In January the hotel is also offering massive discounts to families who book direct. So you’ve chosen your hotel but what about eating out? You know that London is renowned for some of the best restaurants in the world but unfortunately your children’s palates are not quite ready for the exquisite and, let’s be honest, expensive cuisine available at these establishments. Not to worry, The Melita is ideally located for anything you need in London, including restaurants and eateries ideally suited to family dining. Just a tube ride away from The Melita and metres away from Piccadilly underground station you can find a little piece of the Amazon Rainforest, right in the middle of London. This is a visual treat for the whole family, waterfalls, fish tanks and some amazing animals brought to life by animatronics. Where else can you tuck into your dinner whilst crocodiles, elephants, jaguars and gorillas watch over you? 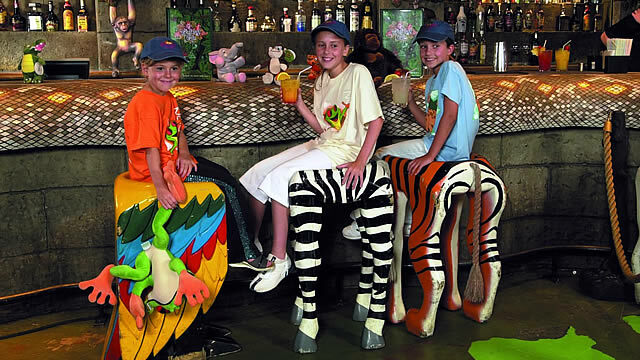 With this much going on around you it’s easy to forget the reason you’ve gone to the Rainforest Cafe! Luckily the American and International menu is just as good as the surroundings. You can enjoy steaks, racks of ribs, burgers and pasta, for the children there’s the restaurants own take on a number of favourites including chicken strips, baked potatoes, macaroni cheese and a create your own pizza option which the kids will love. If you want a restaurant that’s going to keep your children entertained from start to finish then this could very well be it. If you’ve always wanted to eat a burger in the company of an orangutang, then this is the place. You’re relaxing in your cozy and homely room in the Melita Hotel and you’re thinking about which family friendly restaurant to try. How about a restaurant themed around a well loved family movie? How about an eatery that pays tribute to the infamous movie, Forrest Gump? Intrigued? Confused?! 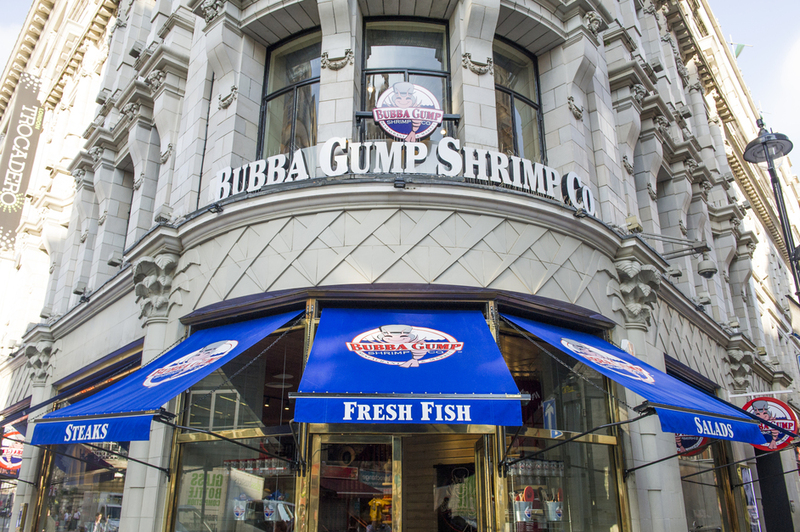 It’s true, the Bubba Gump Shrimp Co. is a restaurant that gives you the opportunity to experience America’s deep south whilst tipping a wink to a much loved film. Again, this restaurant is very close to Piccadilly and Leicester Square stations and therefore simple to get to from The Melita Hotel. The menu offers everything you would expect to find in the deep south of the USA, naturally shrimp is the speciality (or prawns as they are called in the UK). Also available are burgers, salads and unforgettable desserts. The kid’s menu continues the Forrest Gump theme with Mama Gump’s Chicken Strips and Ping Pong Pepperoni Pizza. Maybe your children are feeling a little more adventurous in their appetites, why not pop out for a curry as we do in the UK on a regular basis? England is home to some of the world’s best curry houses, the cuisine has been developed here to the extent that many consider it our national dish! 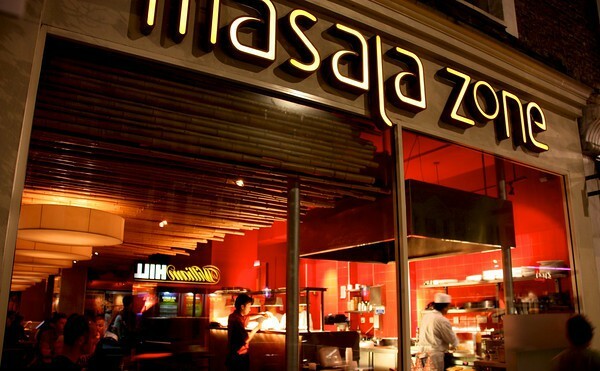 If you’d like to go out for a family curry but are looking for an interesting twist on the theme then Masala Zone in Covent Garden is a must try. The wonderful sights and shops of the world renowned Covent Garden are just 10 minutes on the tube from The Melita Hotel. The Masala Zone restaurant is only a couple of minutes from the tube station. As you would expect, this restaurant offers the mouth watering tastes of India, but it does so in a totally different way to traditional curry houses. The theme is Indian street food and the menu contains biryanis, regional curries and family platters. The kid’s menu contains Thalis (Indian platters) as well as the traditional food with the spice removed if need be. Crayons and colouring books are plentiful too! The restaurant also has its own ongoing theatre show. Hundreds of Rajasthani puppets acting out a Royal wedding procession. One of the best things to note about this restaurant is that lunch can cost from as little as £10 per person and dinner from as little as £15. This from a curry restaurant that has been rated one of London’s best! A vast beer hall set out in an old London warehouse doesn’t sound like the kind of place to bring one’s family to. Throw in a bustling atmosphere and staff dressed as Trappist monks with headsets on and the vibe becomes a little clearer. Belgo Centraal is a huge, bustling, noisy Belgium restaurant located in the heart of the Covent Garden district. If you’ve enjoyed your quiet, traditional English breakfast served at the homely Melita Hotel but want something a little more hectic for dinner, then this Belgium mussel restaurant could be what you are seeking. Mussels are of course the speciality and bowls of them sit in front of most of the people here. The restaurant also does a mean chicken and duck and all come served with french fries. The children’s menu offers the standard mussels and chicken but also has pasta, fish and cheesy nuggets. 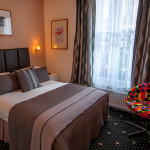 At the end of the night you’ll be thankful that your comfy bed at The Melita is just a short tube journey away, especially if you’ve sampled too many of the 50 Belgian beers on offer here! 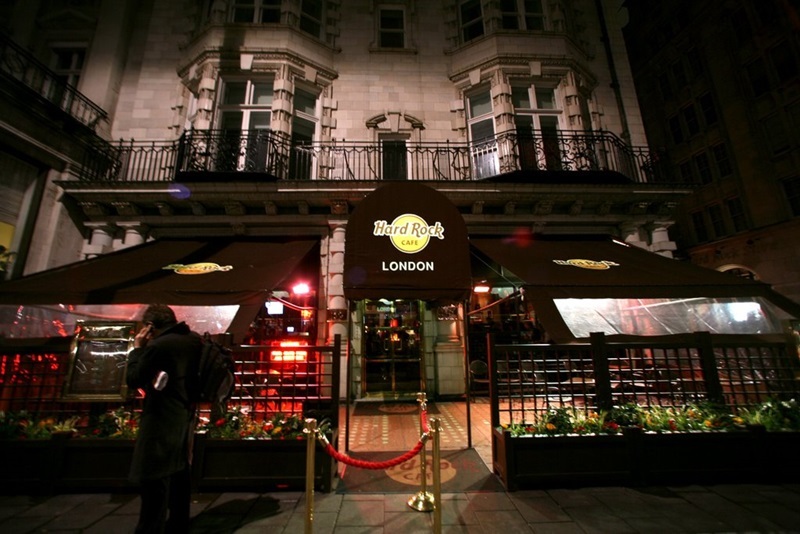 If this is your first visit to a Hard Rock Cafe then you will not be disappointed. If you are one of those families who like to visit these establishments all over the world and collect the t-shirts then visiting the first one that opened will be a treat. 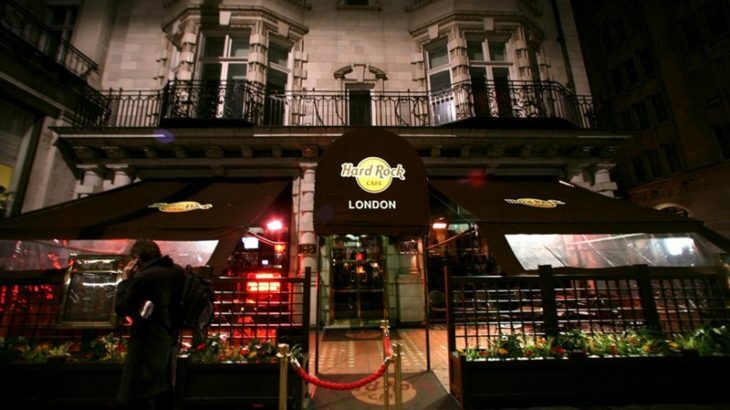 The story of the Hard Rock Cafe in Piccadilly is legendary. Two Americans, desperate to find a decent American burger in London decided to open up their own restaurant instead. The venue they chose was an old Rolls Royce dealership on the edge of Hyde Park, the worldwide story of the Hard Rock Cafe had begun. The venue contains some of the most sought after and valuable music collections that can be seen anywhere in the world. Elvis Presley’s coat, Eric Clapton’s guitar and even Madonna’s expired credit card can be seen on display here. Do your kids not know their John Lennon from their John Legend? Don’t worry, you can enjoy the memorabilia whilst your kids tuck into their Macaroni Cheese, Fish Sticks or Hot Dogs, which are just a selection of the huge menu offered to them by this venue. 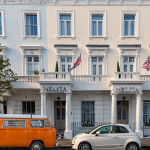 Don’t forget, as well as being the most family friendly hotel in London with rooms to comfortably accommodate families of three or four,The Melita Hotel is also offering huge discounts for stays in January. What better time to visit one of the world’s most fascinating cities?